Renaissance has had a long history spanning 50 years since it’s formation in 1969. With several personnel changes in the beginning years, the sound of the group eventually matured into a unique blending of folk, rock, and classical music including the integration of a full symphonic orchestra. Crowning all of this was the sound of the equally unique five-octave voice of Annie Haslam. During their great success in the 70’s the band toured extensively throughout the world in support of their numerous album releases. Highlights of this era included three sold out concerts at Carnegie Hall with The New York Philharmonic Orchestra and a sold out concert at The Royal Albert Hall with The Royal Philharmonic Orchestra and Royal Chorale Society, all of which were recorded and released as ‘Live’ albums. Over the next few years some members moved on to other musical projects or retired from the business. Eventually the group disbanded in the late 80’s at which time Annie Haslam pursued a solo career. During the following decades Haslam’s solo efforts rendered several albums and tours throughout the world which included some of the classic Renaissance songs in the shows. Except for an album release (Lady From Tuscany) and a brief tour of Japan in 2001, Renaissance lay dormant until it’s 40th Anniversary in 2009. Plans were made to bring the original band back together for a tour, but because of timing issues, it proved too difficult. At this point Michael Dunford, the guitarist and primary songwriter along with Annie Haslam, decided to create a new Renaissance. They were joined by Rave Tesar on piano who was the long time keyboardist and producer for the Annie Haslam Band. He also participated in the 2001 Renaissance Japan tour as well as two tours in Brazil with Annie Haslam. Bassist David J. Keyes was brought on board also from the Haslam band and became a part of the 2001 Renaissance tour of Japan. Drummer, Frank Pagano with his impressive resume and long time affiliation with Tesar and Keyes, was the logical choice to fill that spot. Finally the decision to add a second keyboardist to recreate the sound of an orchestra, took the band to new heights. This role went to Tom Brislin, already known throughout the progressive rock community for his work with Yes and Camel to name just a few. 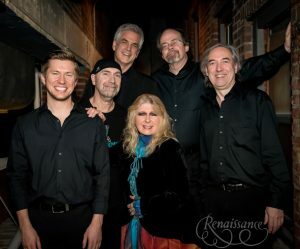 The powerful sound of this new 6-piece version of Renaissance immediately impressed both fans and critics alike. After the sad untimely death of Michael Dunford in 2012, and the medical leave of David J. Keyes a few years later, two more musicians were recruited. Mark Lambert who worked with the band in the 80’s and Haslam’s solo band, replaced Michael Dunford on guitar, and Leo Traversa joined on bass. Both Lambert and Traversa had extensive careers with top Brazilian artists with Lambert eventually making Brazil his home for some years now. With their musical virtuosity, five strong lead voices, newest technological instrumentation and love for the music, they have created a new sound taking them into a new age and performing the repertoire with powerful precision across the world.This incarnation of Renaissance is new and different in it’s own right and is nothing short of amazing!